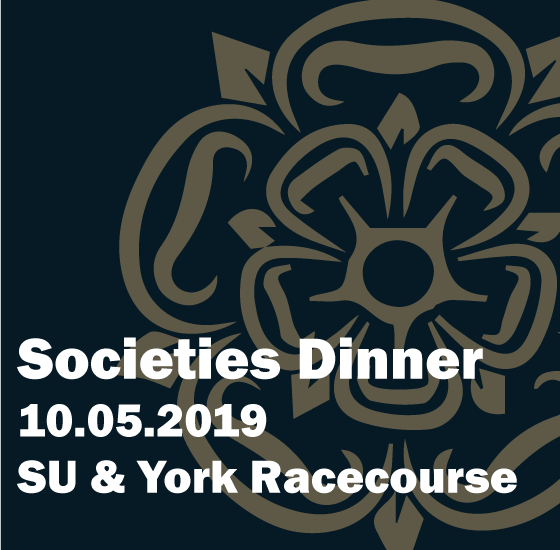 Join us for the second event of YSJSU Celebration Season at the Annual Societies Dinner 2019! Head to the SU from 4pm for your drinks reception and photo opp, followed by a trip to the Racecourse for a great meal, loads of dancing and most importantly the awards for the year! Tickets are on sale from midday Monday 1st April until midnight on Sunday 28th April - both online and at our Info Point during term time. Click here for online sales! Don't miss out on another fantastic night - we can't wait to see you all there! More information for the evening will be on the TV screens in the bar on the night so keep a look out! Please note that by attending this event, you are agreeing to any photos and/or videos featuring you at the event can be used in future marketing material for the Students’ Union. This can include, but is not limited to, social media pages, the SU website and printed literature.